I've included a few photos my mom took from her seat, she is really getting the hang of what to shoot (after 8 years). For space sake I've only included a few manditory poses; Front double bicep, Back double bicep, Abdominals. 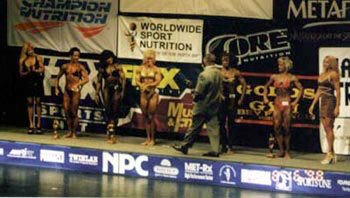 Shots are the top five from prejudging a few Posedown photos as well as "Bring That Trophy Over Here!" This was undoubtedly the most packed heavyweight lineup I've seen in the past 3 years. Everyone came ready to do battle. Carol Quarles looked awesome being nudged out of 1st place for the 4th time at the Team Universe. 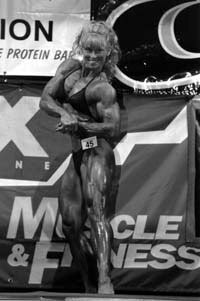 I was extremely impressed with Linda Wood Hoyt and always am awe of her physique though she took the third place trophy. Lisa Aukland is new the Team Universe coming with striated glutes, shredded, dense and muscular, she made an impressive 4th place showing. In 5th place was Midge Shull, three timer at the Team Universe I believe, placing in the top five each time. And for those of you who haven't seen my Signature Pose, here it is once again. This shot must have been taken by every photographer and was used everywhere the contest was covered. Or you can go to Show Me More, to get a few more shots of the lineup. Bring That Trophy Over Here! Yes, this shot has got to be one of my favorites although. I like trying to "milk it" when I know the camereas are flashing. Although, I also like seeing all the mandatory shots cause One Signatue Shot doesn't win Overall titles and it helps me learn from them.